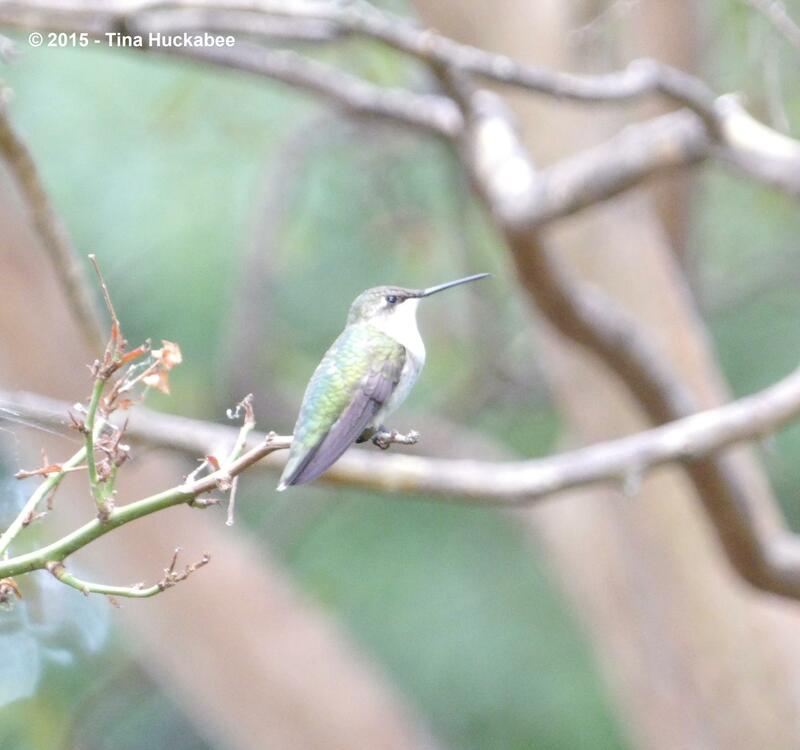 …a female Ruby-throated Hummingbird, Archilochus colubris, rests while surveying her territory, also known as my back garden. The literature about the Ruby-throated suggests that the male is the main aggressor, defending his territory and food sources with great vim and vigor, but I’ve noticed that both genders appear enthusiastically antagonistic to encroachments by critters, especially when those critters are other hummingbirds. Though it isn’t always other hummers that are chased; in July I witnessed a female chase a Carolina Chickadee around the garden–that was a hoot! I employ in a bit of eye-rolling when I hear people exclaim how “mean” hummingbirds are, as if human beings can pass judgement on any other creature in the nastiness quotient. I usually respond to the hummingbirds-are-mean comments with a you’d be mean too, if you were tiny and vulnerable, traveled alone for hundreds to thousands of miles, back and forth, attempting to locate enough food to survive and thrive while doing so. The hummingbird’s migration is a feat that requires a certain level of courage and I’m certainly not going to pass judgement on any critter with that kind of chutzpah. This is the same (?) or perhaps another, female Ruby-throated enjoying a quick junk-food snack of sugar syrup. …but they also love Yellow Bells, Tecoma stans, as well as most plants in the salvia family. But when these adorable birds are feeding, they’re often far across the garden and not easily seen as they move about the shrubs and around the limbs of plants. For purely selfish reasons, I hung a feeder on the back patio cover to better observe and enjoy their visits. They chase one another from the feeder, buzzing past the astonished and thrilled gardener. Hummers also demonstrate possessiveness with their favorite plants, too. Throughout August and into September, one male Ruby-throat claimed three Turk’s Cap shrubs in my back garden as HIS! He spent lots of calories defending his particular nectar-loaded buffet. To augment their liquid diet with protein, hummingbirds eat a variety of insects like mosquitoes (not nearly enough, if you ask me), flies and even aphids, which are plucked off of plants. …but wasn’t situated quite right for the show of scarlet feathers. At off angles, the feathers appear rusty-brown to dull red. After this photo was taken the bird flew away from the tree and toward me in hot pursuit of another hummer which I didn’t see at first. That ruby-red throat came directly at me, in brilliant, flashing color. You’ll have to take my word for it because I wasn’t quick enough with the camera to capture a bird flying that fast. As cool fronts move through Central Texas over the next few weeks, the remaining hummingbirds will wing their way south, surfing blustery winds. 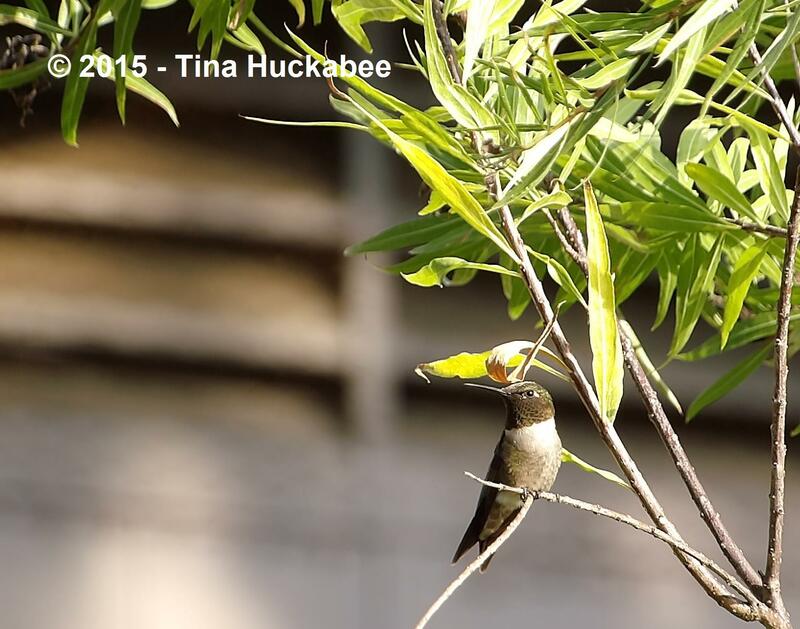 I’ve notice fewer hummingbird antics this past week; Mr.That-Turk’s-Cap-is-mine-Mine-MINE!! is no longer around and I think one or two of the female visitors are gone. There are the occasional hummers who overwinter here, but mostly they reside in sunny Mexico until spring migration northward. They’ll be back in my garden next spring for their courting, during summer for raising chicks, and in early autumn, careening around the garden, chasing each other and providing entertainment for this gardener and backyard birder. And since I think the hummingbirds are looking good in my garden, I’m joining with Gillian at Country Garden UK and her new Looking Good in the Garden meme, which will be a regular Friday feature. Pop on over to read about what’s looking good in her garden, as well as other gardens. 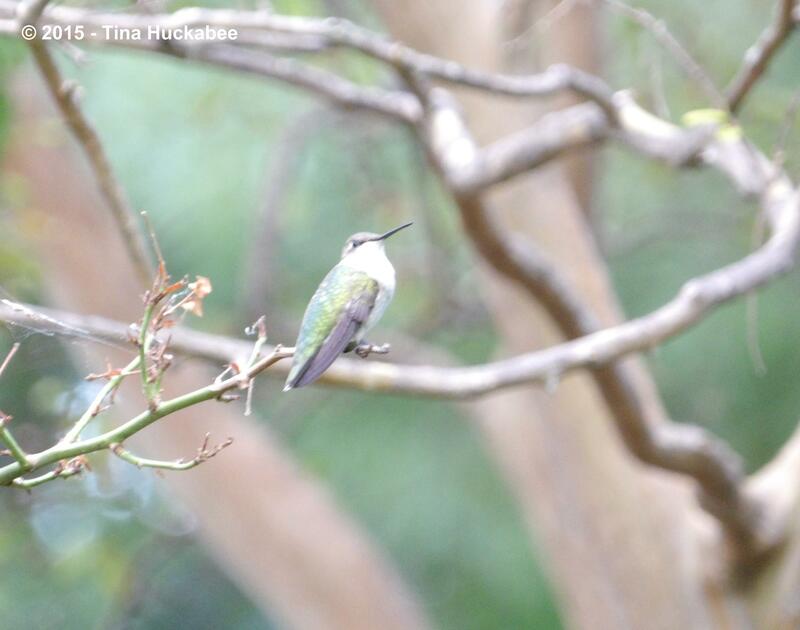 This entry was posted in Archilochus alexandri, Archilochus colubris, Black-chinned Hummingbird, Ruby-throated Hummingbird and tagged Biodiversity, Wildlife Gardening by Tina. Bookmark the permalink. That must be thrilling to have Hummingbirds in your garden Tina, we do not have them over here, there is an occasional Hummingbird Hawk Moth thats gets a lot of fuss, but nothing like your Hummingbirds. What is in the feeders? Hummingbirds are New World critters, but there are lots of videos of them on the internet. The standard recipe is 1/4 cup sugar to 1 cup water. I only make that amount, because I don’t want the sugar water to develop fungus–can sicken the the little guys and gals. They do have to ramp up their calorie intake this time of year for their migration, so while plant nectar is best, the sugar water is helpful. I love hummingbird moths, but I’ve only seen one or two this year. They’re fascinating, aren’t they? Every place has its beauty and interesting flora and fauna–it’s so nice to share that easily now, via the www! Thanks for your fun meme–hope you have lots of participation. I live in southwest Houston. I usually have a lot of hummingbirds fighting over my hamellia. Not this year. I do not know why. One reason is everytime I see one, the neighbor’s cat jumps up and eats it. If you let your cats roam the neighborhood, they kill the birds and HUMMINGBIRDS! Keep your cats inside. Ah, that’s too bad. I’m surprised that cats are fast enough to catch the hummers, but I suppose that they’re so intent upon their feeding that they don’t notice the stealth of the felines. Cats are a real menace to birds–you’re absolutely right that they should be indoors. You wrote a very good defense of hummingbirds. At this point, they need to eat an enormous amount of food for their journey. They are tough little birds and I have seen them poke a bee from the feeder with their beaks and chase Cardinals across the yard. Haha–I’ll be the hummer chasing the cardinal was a sight to behold. I’d never seen one chase another bird species until I saw the female cruise after the chickadee–so funny. Little scamps. They are tough little birds. We all enjoy watching the aerial antics of hummingbirds around our feeder out back. Though I am trying to grow more plants they’ll feed from it is that sugar water feeder that gets the territorial displays going that we’ve noticed. And, perhaps selfishly, we do love seeing them come close to the house. Our (indoor) cats especially enjoy watching them zipping back and forth. Best show in town. Those are some pretty great shots. Hummingbirds are such fast and erratic flyers and when they light it is often in the midst of foliage and far away from excited gardeners with cameras. The zippiest butterflies seem poky by comparison! Regular Friday posts! Looking forward to it! Best show in town, indeed! I really wanted to see the hummingbirds, up close and personal, and the only way to do that is with a feeder, on the patio. There are lots of plants from which they feed, but it’s so hard to observe them in the garden. I say that and yet, yesterday morning with camera in hand, I’m looking around the back garden for hummingbirds (or really, anything of avian or insect interest), turned around and one was working the white S. coccinea about three feet from me. I think they snicker at my birding ineptitude. Ahhh, you are going to miss them when they go. Does your syrup feeder work for butterflies too? I will miss them. They’re here for a long time, but elusive until late summer when they start up their chasing of one another. I can’t say that I’ve ever seen a butterfly at the feeder. I know some folks have reported seeing honeybees at feeders, but I haven’t seen that either. I think you’re very wise to keep the dead tree! Birds and insects of all sorts nest in dead wood and one of the principles of a wildlife habitat is to have some dead wood available for wood nesting bees, birds, etc. Good for you! Hummingbirds are so much fun to watch and they do preen, don’t they? Thanks for visiting my blog. This article is very informative. Where I live in Upstate, New York the colors of the hummingbirds are red bellies and lots of green on their backs. Next year I will try a feeder. Thanks–I enjoyed looking at your Looking Good post. The real advantage with a feeder is simply human proximity to the feed-ee. Otherwise, the little scamps are so far away for observation. How wonderful that the humming birds like to visit your garden. I have always thought that visiting wildlife brings an extra dimension to a garden. I couldn’t agree more. A garden isn’t a garden, unless wildlife is present. Aren’t they amusing? I have a new group passing through Coastal Georgia. They like my shrimp shrub and check out the dahlias. Yes, they will go for the junk food too! I grew up in Corpus Christi, along the Gulf of Mexico coastline and my mother grew shrimp plant and I distinctly remember hummingbirds visiting her plants. Enjoy observing them! Even after all these years I rarely see hummingbirds so it is always a real treat to see other people’s photos. I never made the Turk’s Cap/hummer connection before but that makes perfect sense now that you mention it. Did your mother grow the yellow shrimp plant or was it the more pink coloured one? Great post! I love having hummingbirds around but they’re have never been enough to see hummingbird wars. I’ve been tempted to put out a hummingbird feeder but never have – don’t they need daily cleaning and changing? Their favorites in my garden are mostly annuals – Cuphea, Pentas, and Tithonia. For perennials, they will go for Trumpet Honeysuckle and Cardinal flower. Thanks! Hummers like pentas here, too. I’ve grown cuphea, but I don’t recall seeing Hummers nectar at them, but I’m not surprised that they’d like them. I only make a cup of syrup and yes, the feeder can grow fungus, so they should be thoroughly cleaned, once a week. I need to bring mine in, as most of my little birds have buzzed southward. Sadly, my “regulars” have left for the season, but others are still migrating through. I’m keeping my feeders up through the next few weeks for any stragglers. They also still have many Fuchsias, Zinnias, Blue Mistflowers, and numerous other blooming plants in the garden. It’s been a mild autumn so far in the Midwest. Your photos are fabulous! Mine are gone too, in the last couple of days. Interesting that yours feed on Blue Mistflower–I’m not sure I’ve ever seen that, though my mistflowers are just starting their blooming and the hummers are gone, or at least, mostly so. I get a lot of hummers, too, and they are feisty! However, the chances of me ever snapping a photo of them are slim to none. They’re just too fast. I wonder if there was a nest nearby this summer because I kept seeing a male and female hanging out together. 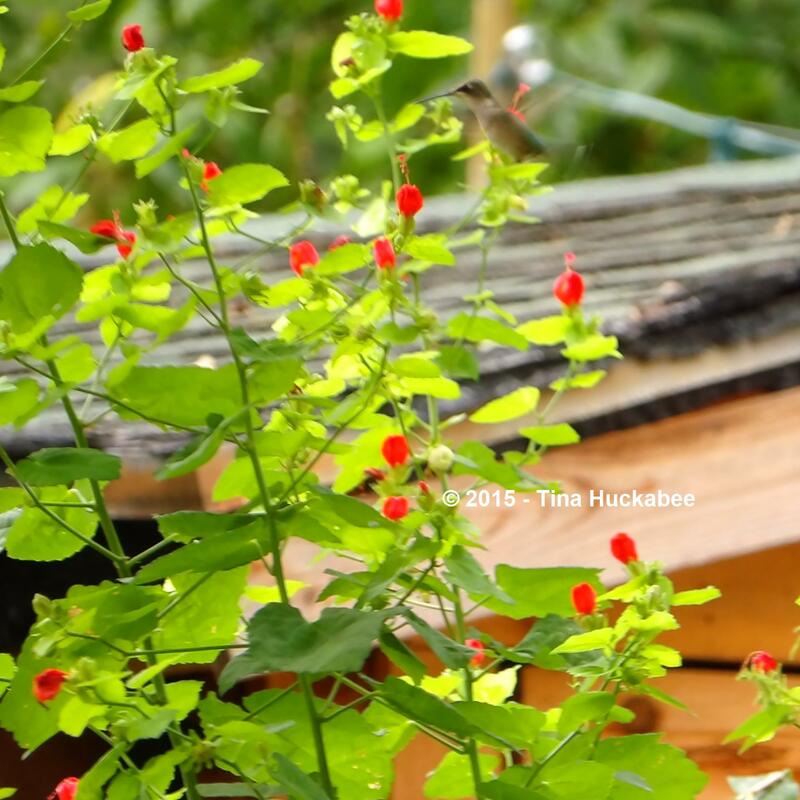 I’d love to grow Turk’s Cap but it isn’t cold hardy here. Feisty is a good word to describe hummingbirds. They are so hard to photograph–I didn’t get any really good shots of hovering or flying ones, just those perching, but I’m not going to complain–those captures were difficult enough. There must be some nesting nearby, though I’ve never seen a nest or offspring, except in others’ photos. Beautiful pictures and I loved reading the comments from others. I live in Seguin, Tx and have notice the dwindling of my 6 regulars this year, down to 1 or so per visit to the feeders and plants. I hate to see them go but will have an opportunity this Winter to formulate a plan to have more plants available next Spring for their return. Perhaps in my “golden years” (I’m 73) I will shock my granddaughters by learning how to have a blog like others I have seen on yours. I have really enjoyed it! It is bittersweet when the migratory birds and insects do what they’re supposed to do–migrate. 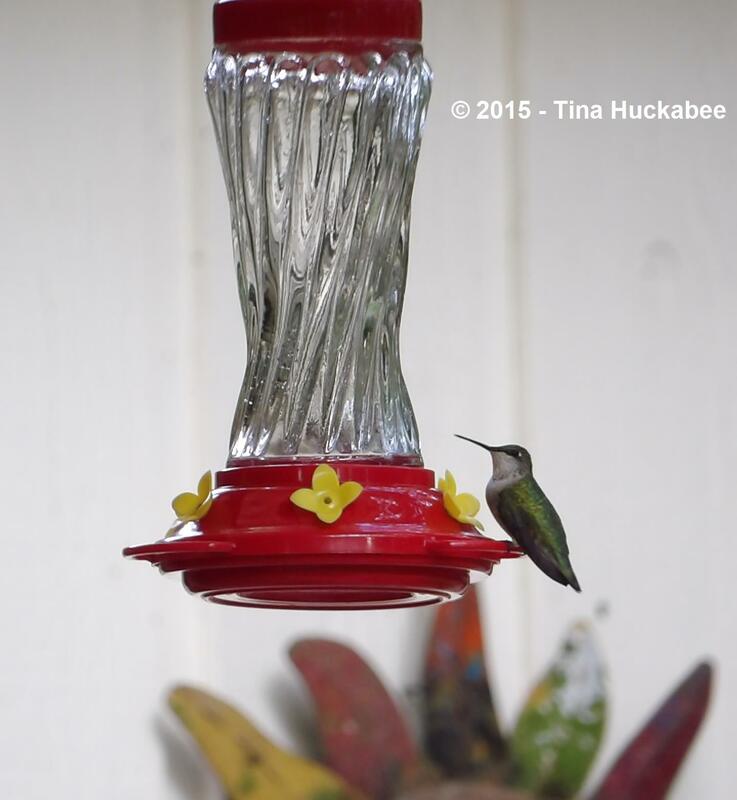 I hope you can have lots of yummy plants for the hummers next spring and summer and a blog–that would be fun!! They are so enjoyable! You’re lucky to have them around. Now that I have more space I cannot wait till next season (!) to plant more of their favourite plants! You know, it’s okay to be selfish sometimes. And it’s not like you’re not willing to plant for the little guys-n-gals. Good luck–write about them next summer/fall! I will. I have an Aquilegia collection prepared for the early arrivers – I had just a couple at the other place and they really like them; plus many more! I’ve never seen hummingbirds at any of my aquilegia species. Not to say that they don’t feed at them, I’ve just never seen it happen. The two native columbine I grow are reportedly hummingbird favorites. Do post about yours next spring and summer! I’m southern too. Or at least, southwestern, which is sort of southern! Those northern gardeners do get to enjoy the migratory birds quite a lot, don’t they? I should of said the southern hemisphere,I’m in Australia.